When we feel good about development in Gujarat, media always showcase Mr. Modi's Chauvinistic and religious characters, media links him with RSS, Hindutva and communal elements. Why? we expect the same from media! When people in country side are feeling good about Bijli, Sadak, Paani provided to them, media try to give us the sample statistics about how many Muslims and how many Hindus have got the same benefits. It actually try to give us the divided figure which would fuel the anger and hatred feeling of people and jeopardising the secularism. Showing the Godhra episode again and again, broadcasting the aftermath of killing and terrorist attacks without even bothering to sensor the sensitive pictures, showing the undressed video footage of a woman who was raped on the broad day light [source], analysis of same vote bank politics again and again, etc. are igniting the hatred feeling and making people desperate for change in the leadership which may prove to be unhealthy in any democracy. I really don't believe that this 'media crisis' would affect people's verdict in the elections, just because the media glare is simply an urban affair! Recent Gujarat election has received an unprecedented media hype in the history of Indian politics. Not All would believe that this "Media Politics" is merely an urban affair! When it comes to ground zero, country side India still rules. Bijli, Sadak, Paani formula still works but not alone any more. 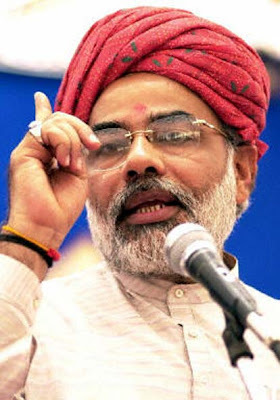 Mr. Narendra Modi has shown a perfect balance of Nationalism and Chauvinism which worked at nick of the time. I believe citizen of Gujarat have shown exceptional characteristics of modern democracy. In experienced democracies like one in United States, every president will get a second chance to prove his ability. India has a peculiar mindset. If we cannot see the change within a short period of time, we start digging out the weaknesses of the leader and we, along with the media ensure that the elected leader will spend rest of his tenure in proving that he is innocent. Where does he get time to change the lives around? Exceptional development in media has fueled the political crisis. Looking at Mr. Modi's winning strategy and Gujarat verdict, its pretty clear that Indian voters are matured, they know whom to vote if they want the real change. They can clearly understand who can change their lives. Mr. Modi's strategy is understandable if we put ourself in his shoes. His strategy of "being in the system to change the system" works! India Today has awarded him the best chief minister twice in three years. Apart from the controversy that he always generated due to his staunch support of Hindutva, he is also regarded as an excellent administrator. Considering Indian context, we don't need chief ministers who are just good statesmen, we need chief ministers who can understand the country side India and provide them required benefits which brings the equality in the society. 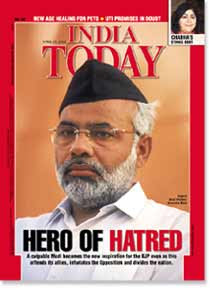 Lets not follow the lines of media to project communal characteristics of Mr. Modi, that may be his winning strategy. His association with RSS might have created controversies but that has made him live a disciplined life and given him exceptionally great organizing skills[...]. He was a back-door operator for his party before he became chief minister, now he managed to be front runner only because of his exceptional political skills and charismatic characters. On the top, he may look like a chauvinist, but who cares as long as he does good work? Lets feel good about his good work in Gandhigaon, the Gujarat. He has created his own style of administering the state in a much better way than any other chief minister in the country. I call it Modigiri! Hope this Modigiri in Gandhigaon can change the lives around! Beware of the Fourth Estate always, they are quite moody and play tantrums here and there. But Modi did reverse of what Krishna and Naidu did and won ashte.